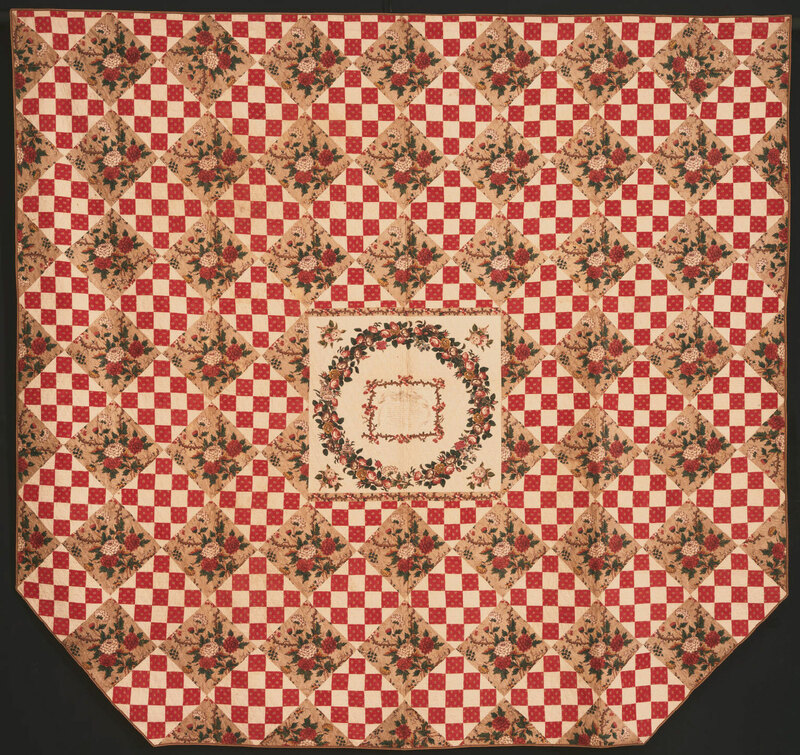 This dedication to Hymen, the god of marriage, combined with the reference to the yoke, which symbolizes the joining of a couple in matrimony, suggests that the central motif represents a bridal wreath, whereas wreaths in other quilts are sometimes associated with mourning. The pairing of Miss Gordon's name with "& Co." may refer to her fiancé. The inscribed central square is surrounded by nine-patch pieced work that alternates with roller-printed floral chintz squares, both set on end. This floral chintz was a popular pattern that appears in a number of appliqué quilts in the Philadelphia Museum of Art (see 1952-63-1). Nine-patch is one of the simplest pieced-work designs, with many variations, and was frequently used by girls as young as six for their first patchwork quilt, which they often made for their dolls. The bottom of this quilt has been cut on the diagonal to accommodate a four-poster bed. Dilys Blum, from Nineteenth-Century Appliqué Quilts, Philadelphia Museum of Art Bulletin (1989), p. 24.